As your mother always said, practice makes perfect. Luckily, every day you are presented with countless opportunities to perfect your posture while sitting, walking, sleeping and...showering. Yes, that’s right. You can, and should, be aware of your posture even while performing the most mundane of tasks. So before your next shower, take a few meditative minutes to enjoy the healing properties of warm water...and then pause before you grab your shampoo bottle. Why? Because the half-minute you spend lathering your hair is probably the most vulnerable shower-time for your back. Most people in industrial cultures, when lifting their arms above their head, will sway their backs and put themselves at risk for a couple of problems. Swaying is an excessive arching of the back that compresses spinal discs and compromises circulation around the spine--not good. In the shower, be careful not to lean your head too far back while shampooing because this movement can exacerbate the sway. To prevent this, I recommend a technique called “anchoring the ribcage”. I teach this maneuver to students to help them achieve a healthy shape in the low back. To anchor your ribcage, you want to contract your internal oblique abdominal muscles to pull the front of the rib cage downward and inward. This is easier said than done! Your goal is to lengthen and straighten your low back. To isolate the internal obliques (as opposed to rectus abdominis, the ab muscle modern Westerners are more aware of and tend to overuse), it helps to guide the action with your forearm or fists. Place either your forearm or your fists over the lower border of your ribcage (you want to feel bone), and gently press backwards so as to rotate your ribcage forward a little. When you think you’ve got it, you can assess the spinal groove in your low back with your fingers. A healthy low back shape has a mild groove, embedded bumps (your vertebrae), and soft ridges on either side of the groove. If you feel taut muscle ridges on either side of a deep spinal groove, then your back is still swayed. 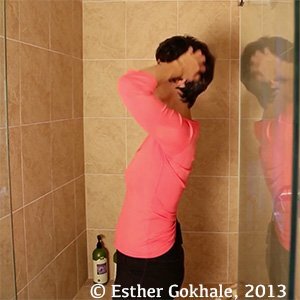 Perform this maneuver to maintain a relaxed and lengthened position next time you shampoo. Lather, rinse, repeat, and before you know it, you’ll be a proper posture pro! Join us in an upcoming Free Workshop (online or in person). Find a Foundations Course in your area to get the full training on the Gokhale Method! 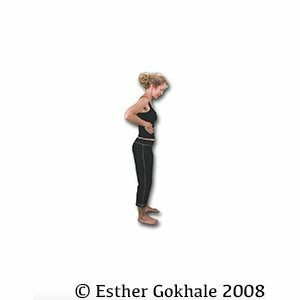 We also offer in person or online Initial Consultations with any of our qualified Gokhale Method teachers. Previous Post: Secret to Aging Gracefully? 5 mounths ago i was in a bad situation: a cifotic neck produced one hernya, paralising my neck, shoulder and arm, about the pain i have nothing to tell, you know it. Stefano, a osteopath,have saved me from surgery and is helping me trying to regain health and a normal function of the body and i was searchig a method that fits to me to mantain as best as possible between a therapy and the next one. looking at your work, how it fits to life practically, how is all-in-one, apreciate how all your teaching flows like a fantastic melody, coming from an ancient time to remember me something... my body somethimes seems to say me:"oh...yes! i remember when i was a little child this was the confident, hopefully and joyfully posture that i had" gives me happiness! For sure i'm considering to subscribe on coming soon foundation course in Rome. i'm going well with your method, and sometimes i reach a state of balance, but mantaining that is hard and often my toracic spine bulges out, cervical vertebrae trying to return in poor alignment, in this situation i have to take repeated foam roll sessions and engage my inner corset very strong to slowly restore a balance, that doesn't lasts a lot. I don't espect a resolving reccomend, i just felt it was nice to write you and let know people that your method is really helping me, a "keep trying" will be good, the energy you are senting to the people is pure! I will try organise a webcam for the next online workshop... i hope to become one of your success storier,one day! Congratulations on your persistence and your attitude! I'm so glad we have a course in Italy for you - please keep us posted on how it goes. I'm glad you are combining this with support from a trained medical professional - this sounds very sensible in your case. I read this blog entry a year ago and at the time I sort of breezed through it because, to be honest, I didn't think it really applied to me. I thought I was already following your 8 steps pretty thoroughly. Well I was wrong. LOL. There are so many nuances and little things we tend to forget (as you've commented on before!). Long story short: I still had a swayed back and didn't realize it until recently. So I returned to the book (and this blog entry) and finally the rib anchor makes so much sense. I have learned to check those lumbar muscles and the hip crease for tension. Very helpful. Also, your instructions on laying down and learning to raise your arms without letting your ribcage pop out is wonderful. Another trick I learned someplace else is to stand with your feet a few inches from the wall and lean against the wall and press your ribcage down flat to the wall. (The area where your brastrap goes around should be touching the wall. To maintain the proper anteversion in the lumbar area I stick my arm down low against the wall to prevent me from accidently tucking my pelvis as well. It works pretty much the same way as laying down only sometimes is easier to do when you have a spare wall and nobody is looking...ha-ha. So thanks again for this post. They are helpful to review every so often.